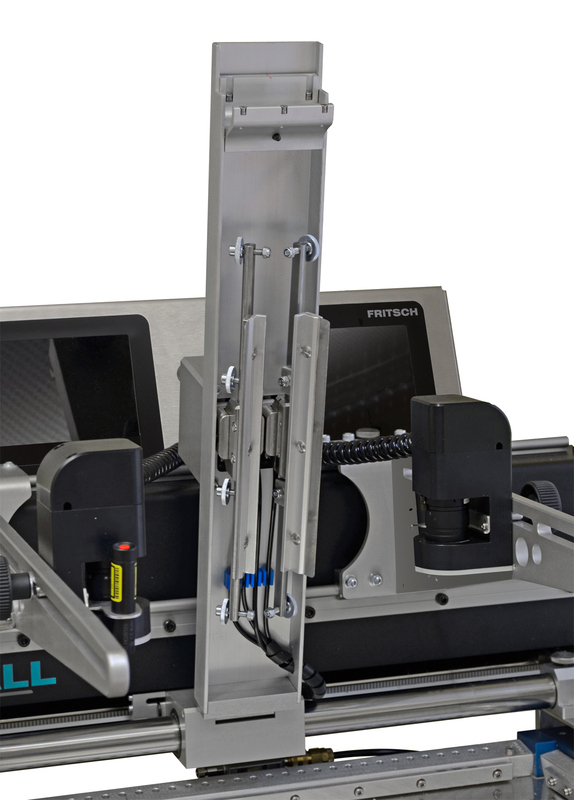 The FRITSCH semi-automatic stencil printer is solid built and very easy in operating. These are basics for clean and reproducable printing and finest structures are no problem. 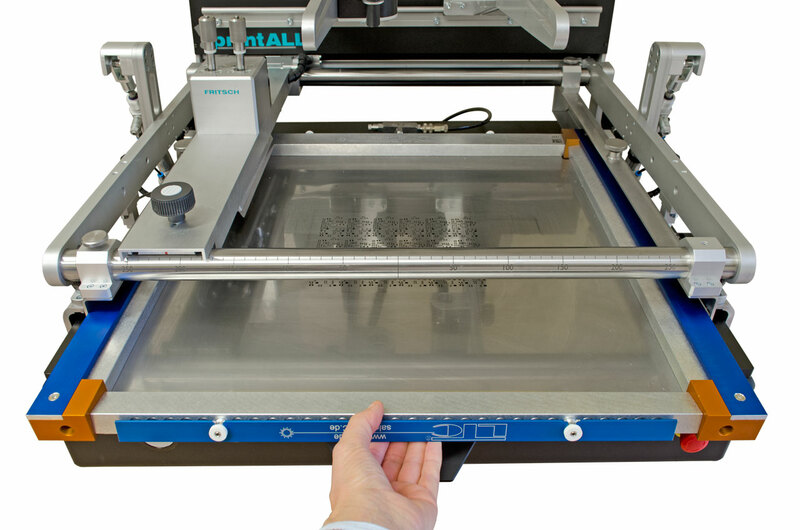 The semi-automatic stencil printer printALL210 is solid constructed and the operating is simple. Set-up times are reduced to a minimum because tools aren't necessary. PCBs with max. size of 440 x 430 mm can be realized. The flexible PCB intake enables the stencil printer to be set up within only a few minutes. The adaptions to a different frame format can be made without tools. The optional test print frame reduces the minmial set up time once again. 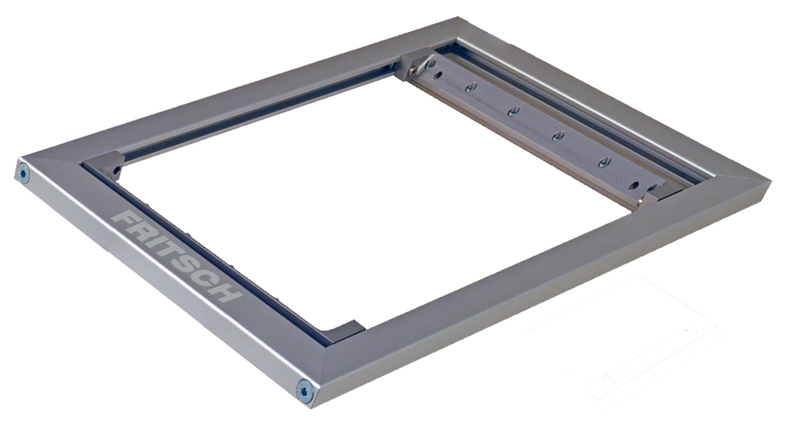 Common, sturdy aluminium frames and other usual quick change systems such as Stencilman, VectorGuardTM and Zelflex or the like are used without the need for further adaptions. That enables the printing of the smallest of PCBs up to a maximum printing surface of 560 x 460 mm. The stencil printer has a double squeegee for flawless paste printing in both directions. The paste is applied within the double squeegee and is thus appliable in both directions.The contact pressure of the squeegee can be set by a screw. The angel of the squeegee is adjustable from 45° up to 90°. The optional microprocessor controller controls the lowering of the motoric squeegee, controls the motor-driven print and makes sure the print is even and reproducible. 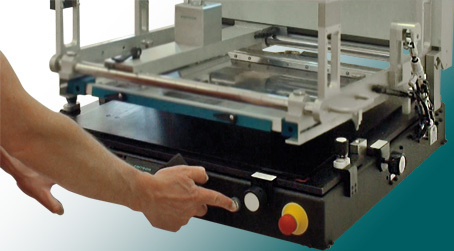 After printing, the table is automatically lowered over the pneumatic cyclinder in a parallel position and the printer can be opened. All processor-controlled functions of the printer are handled by an optimized intuitive Touch Display. There is also the possibility to save product-specific programs. So the production can start only by choosing the accordant program. The PCBs are fixed by easily adjustable magnet fixtures. The fixture can thus be adapted to a different PCB within a few seconds. The fixtures and supports included in delivery enable the printing of PCBs on one or two sides. The parallel table lowering ensures clean printing results even in the case of large PCBs. A smearing of the printed layout is thus part of the past. With the optional control, the lowering automatically takes place after the PCB has been printed. Its stable set up is the basis for today’s requirements of fulfilling the high demands of production quality. This is also safeguarded when the smallest of chips and fine structures come into use. Conic centering pins guarantee high repeat accuracy and also make fine pitch prints with a grid pattern of 0.5 mm possible. Both the stencil and the squeegee itself can be easily cleaned by simply opening the squeegee unit. The squeegee unit can be locked into the open position so that both hands are free for cleaning it. In the case of fine structures in particular, the vision system alleviates the positioning of the stencil and thus increases the accuracy of the print. The vision system has two freely adjustable cameras which are assembled above the print frame. The cameras are positioned by using one hand without tools. When removing or putting in the PCB, the camera system rotates with the tension frame. The whole visionsystem can be displaced for cleaning the squeegee or refill the welding paste without the need to be adjusted again. No standard stencils are manufactured for the likes of prototypes or small series. Instead of that, small stencils are made available that are only a few millimetres larger than the PCBs. With the prototype frame, precisely such stencils can also be fixed and coated professionally. For smaller stencils, there is a hand scraper included; larger stencils (> 250mm) can be manufactured as usual. The vacuum table serves as a safe fixating of foils or thin PBCs. The table is fixed with magnets in the printing area. So, it is possible to change fasten between solid PBC and flexboard without using any tools. Every vacuum aspirator has a stroke of 3 mm especially for small or very warped PBCs. This guarantees to hold the PBCs on a defined printing height. The aspirators can be positioned freely and are regulated by the control mode.